I would disagree with the comments regarding Nunn and Polgar unless the audience of the book is top tier chess players (I don't think it is). Those examples are of people who have spent a good part of their life working on their pattern recognition skills, and this is probably a better method than the rule based approach to evaluation provided by the author (and used by some good players like Larry Kaufmann who by his own admission has pattern recognition skills that are just terrible). But for the great majority of players of intermediate players, solid evaluation rules are probably very useful, and criticism from top players of this type of approach just isn't helpful. His exampled positions were " not " complex. Perhaps they weren't meant to be. I was more interested in his scoring of those positions. I was never good at multitasking! >His exampled positions were " not " complex. Perhaps they weren't meant to be. I was more interested in his scoring of those positions. I could add such positions relating to those terms, that your head will start swirling. >I would disagree with the comments regarding Nunn and Polgar unless the audience of the book is top tier chess players (I don't think it is). Those examples are of people who have spent a good part of their life working on >their pattern recognition skills, and this is probably a better method than the rule based approach to evaluation provided by the author (and used by some good players like Larry Kaufmann who by his own admission has >pattern recognition skills that are just terrible). But for the great majority of players of intermediate players, solid evaluation rules are probably very useful, and criticism from top players of this type of approach just isn't >helpful. Hi BFL, thanks for your support. What is the difference between rules and patterns? My book is following the pattern approach. When you look at the output of even a relatively small neural net that can be run on a computer, it's generally hard to understand the intermediate results that contribute to the final outputs. The best chess players generally have finely honed pattern recognition skills when it comes to evaluation that work well (significantly better than those in an engine with similar search depth to a skilled human chess player). Unfortunately, there is no reason to believe that great chess players will be able to explain the intermediate steps or features and weights which make up their evaluation of a position. >Unfortunately, there is no reason to believe that great chess players will be able to explain the intermediate steps or features and weights which make up their evaluation of a position. which patterns constitute the building blocks. It is interesting that you mention here ' pattern recognition ' which combined with rule based approach is not usually undertaken in most chess software training programs! With the exception of one that I know of -Stefan Meyer-Kahlen Chess Tutor program. He places pattern recognition as essential to master an understanding of the board. You don't progress to the next step if you get one position wrong -may as well just get the concept under your belt and move on. In the beginning- it quite frankly drove me nuts, because I'm a perfectionist. Getting one wrong and I ended up starting all over again-and that is when you really find out if you just memorized the position or learned the concepts. This was a few year ago. There was someone else on the forum who comment on Chess Tutor -I forget who it was. I do wish Stefan had developed his program further. > It quite frankly drove me nuts. Always wondered what it was...thanks for clearing that up! That! Is a very strange example. However, not so strange for someone who is more attentive to what is going on problematically on the board than the person moving the pieces creating the problem for him. I'd rather not call it " pattern recognition " rather I'd reference it as understanding positional board imbalances. Which, I might add infers a rules based understanding! Although, I think you are coming to this from a totally different perspective. Facial recognition is actually something that most people are really good at, and it's been demonstrated that people can recognize famous faces, e.g. George Washington, with only 16 gray scale pixels! Well, I'm guessing that means that you aren't interfacing with very many black people in Bulgaria... Try living in East Cleveland for a while, and your facial pattern recognition skills will likely improve significantly in this area! >Well, I'm guessing that means that you aren't interfacing with very many black people in Bulgaria... Try living in East Cleveland for a while, and your facial pattern recognition skills will likely improve significantly in this area! Give me all those black men. Well, it didn't take much for this thread to spiral down and get delimited to ethnocentric terms of class-consciousness. >I'd rather not call it " pattern recognition " rather I'd reference it as understanding positional board imbalances. What is the difference between 'pattern recognition', 'rules based approach' and 'imbalances'? I guess we are talking about one and the same thing. and how accurate they are. For example, all modern top chess engines have significantly more evaluation than top engines from, say, 10 years ago. So, in order to get better, you should consider more, including patterns no one has thought of. There's definitely a difference between rule based processing and pattern recognition processing. In fact, they are performed in different parts of the human brain. You're coming from a different perspective. > and how accurate they are. No doubt about that! I might be able to compete to "some" extent with a chess engines in the opening in that it will follow some level of statically acceptable book moves. Once it leaves book, I'm on my own and calculating against a chess engine isn't fun. >Hi, Lyudmil, let me first state that I like the overall idea you tackled and the apparent energy you put into putting this into presentation. One of the major problems isn't the "idea" it is your attempt to translate that idea >into English. I haven't read the book just a smattering of the excerpt . Also I would have like to see more of your ideas on piece values as related to the transitioning position presented -that is, why those values changed. >That is just my humble opinion. >Of course, when one gives their inferences of understand the strategic and tactical elements of a given position you will be suggesting to the reader your own level of understanding of the game of chess! >There is where the sand separates from sea, when an International Master like John Nunn or , Susan Polgar, who in one of their books is giving instruction and someone like myself can only attempt to report back from a >limited understanding what I've gleaned. because they are higher level and more precise. I apologise again, but that is true. At some point in time, this truth will become aparent to everyone. That is what concerns the chess knowledge base. extremely difficult nowadays for an evaluation idea to succeed in Stockfish, the likelihood is something like 1%)"
That is right, but only good evaluation ideas succeed, for the most part. no chess authors have expounded in the past. than what we are accustomed to accept. All the sophisticated chess knowledge and all the greatest chess games are ahead of us! I have ascertained this during my countless analysis sessions. only good evaluation ideas succeed, for the most part. That is true. Being a good evaluation idea is a necessary, but not sufficient, condition for succeeding in a chess engine. To be sufficient, the idea must also not slow down the engine to the point where the improved eval is more than compensated for by a crippled search. I believe you are correct that we are much closer to the beginning than the end when it comes to chess knowledge. Chess engines compensate for this by searching deep into the game to see the results of many different options. People don't have that luxury, so a better understanding of chess knowledge based on better position evaluation with minimal calculation is much more important. Sorry for the somewhat arbitrary question: What is the approximate size (entropy) of an evaluation function in a chess engine? What do you mean? Lines of code? Binary bits? Size of the equivalent logic in a human? Any chess engine or a strong one? I was thinking of bits, as coded. But any measure would be helpful. Also, I was thinking of strong engines. Stockfish would be the obvious choice then, being open source and one of the strongest if not the strongest engine currently available. I think someone could give you the size of the source files that pertain to the eval function, but a lot of those bits would be unnecessary, pertaining to spaces and variable names and syntax decisions made for readability as opposed to terseness. Then there's the issue that when compiled it is initially going to be made much more efficient by the compiler using the minimum possible amount of information/instructions, and then made binary, which will serve to lengthen the needed bits in most instructions. Would probably be a nightmare to say just look at pawns.cpp/evaluate.cpp/endgame.cpp, ehm, material.cpp, movepick.cpp, psqt.cpp and perhaps bits and pieces from other files, try and get them to compile into something so that all the syntax/comments and such would be stripped out, and then look at the file size of the resulting binary. Another strategy would be to gut its search function, thread stuff, tablebase support, board representation, move generator and see if what's left will compile. Shrug. Someone actively working on SF would be in the best position to do such a thing. The SRC dir itself is ~430k, about ~140k if I include just those files mentioned above. Unfortunately there is no reliable way to translate that into what the total contributions to the binary file size would be, as a smaller source file could contain greater and lengthier instructions than a larger one when compiled. The exe file size could represent an upper bound, stockfish_17111816_x64_bmi2.exe for example is 1,210,880 bytes (9687040 bits, 1.2 MB). Thanks! That at least gives me a rough idea. What would be a lower bound on how much inefficiency is in a source code (written by competent humans) before compiling? I assume this also depends on many things, but any guess would be helpful. >What would be a lower bound on how much inefficiency is in a source code (written by competent humans) before compiling? I assume this also depends on many things, but any guess would be helpful. Really though I wouldn't know where to begin on answering this question. Just depends on way too many variables. For one there's the trivial things: comments are removed, variable names can cease to exist entirely (functions may only need relative positions of data), there's absolutely no formatting, like literally it's just an endless string of 0's and 1's that gets picked up in 64 or 32-bit pieces. Simple lines in C or C++ often require many instructions, for example here is a C code on the left and the corresponding assembly on the right. When converted to binary each of those instructions and the data they act on will be in 64 or 32-bit binary pieces. 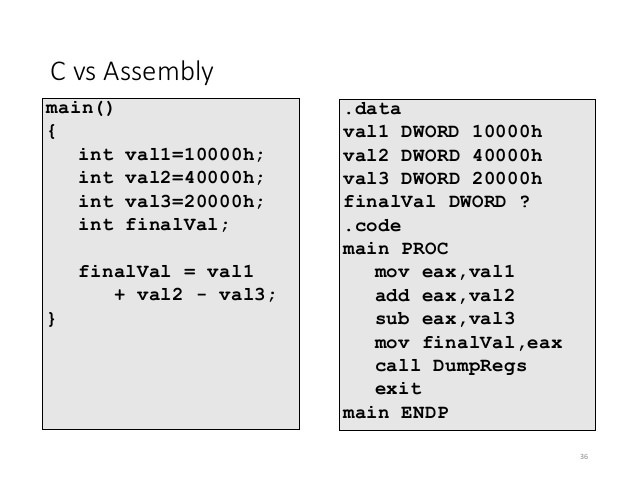 It seems that, based on very anecdotal evidence, that going from c++ -> assembly -> binary represents an increase in the size of the output file despite a lot of unnecessary things being removed. >I was thinking of bits, as coded. But any measure would be helpful. Also, I was thinking of strong engines. the precise numbers, Stockfish eval consisted of around 3 or 4 thousand lines of code(white space, etc. included). exponentially, maybe 1.5 times bigger in terms of lines of code. Of course, size not always means quality, there are other factors to consider, this is just as an indication. so this makes any comparison even more uncertain. search suddenly reveals the truth is otherwise). But I find it hard to believe that it's possible to systematically exploit this in regular tournament conditions. The traditional explanation is the horizon effect. In closed positions humans can think strategically as opposed to concretely whereas the computer is hopelessly bound to its concrete calculation. So in closed positions, the computer kind of spins its wheels on boatloads of dumb lines. To give a really poor example to illustrate the concept, if you have say a black king on h1, a white king on f1, and a white pawn on a2, it's immediately obvious that white has a won position to a human with zero calculation. The computer however has to either contain programmed in heuristics that account for this case, or calculate it out. Of course calculating it out takes mere microseconds for the machine because there are so few legal moves, but the point is that a human wouldn't need to do such a thing at all. I still find it surprising. For a while, I thought that the issue might be a search tree explosion: in a closed position, there are too many equally good-seeming moves in a position that all need to be calculated. But the thing is that engines still reach very significant depths in closed positions. In my opinion, human strategizing isn't usually that long-term - I don't think my plans in closed positions are deeper than 35 plies. I recently saw a game between Fire and Houdini in TCEC in a closed king's indian position that was really unbelievably bad. Somehow, their search often seems to miss the relevant pawn levers and breakthroughs. >For a while, I thought that the issue might be a search tree explosion: in a closed position, there are too many equally good-seeming moves in a position that all need to be calculated. >But the thing is that engines still reach very significant depths in closed positions. Sure but the depths don't mean as much, especially if good moves are getting pruned early. >In my opinion, human strategy isn't usually that long-term - I don't think my plans in closed positions are deeper than 35 plies. It's not n plies at all, it's 'I'll put the rook here to oppose the opponent's rook', or 'rook goes here because this file is most likely to open', or 'I'll transfer the knight here because it'll have the best chance of a future outpost', or 'I'll put the king here where the enemy bishop has less of a chance of reaching it'. Such moves from a concrete standpoint might have very far reaching effects but we don't think of them that way. If you just thumb through some GM games and look at certain pieces that don't move much, you come across things like a player plays say Rc1 some time in the opening, and then 55 moves later the rook plays some important role on the c file and is just in time for some particular action. Did the GM know that was going to happen when they played it? Of course not. Strategy and positional play are sort of ply-less like that. Strategy can be really general, like preparing for a pawn break or securing certain squares. >I recently saw a game between Fire and Houdini in TCEC in a closed king's indian position that was really unbelievably bad. My apologies to Fire, it was Chiron. Black's play was fine, although I have my doubt if that Nb8-a6-b4 maneuver was necessary. But what white did was just ridiculous. >Black's play was fine, although I have my doubt if that Nb8-a6-b4 maneuver was necessary. But what white did was just ridiculous. White could have drawn with 17.g4(so that the g2 shelter pawn is no more backward, which loses the game). supporting g4 and should hold, no breaking through. Give Houdini a more complex KID position and stronger opponent, and it starts blundering. I don't know which of the 3 top are worst in closed postions, all seem to almost share the same bad place. I wanted to make an observation about the g4 move from the Chiron-Houdini game, and I wanted to post the fen just before white's 17th move, but am seeing only a pgn option. Anyone knowing how one could post fens here? (in any case, I would be glad if someone could post above position, or you can just refer to the game. I was thinking about this position and how concepts in 'The Secret of Chess' work. So, why is 17.g4 the best move without a deep search and a lot of calculations, just using pattern recognition? has appeared(g4 is on the 4th rank, with opponent f4 pawn next to it on adjacent file). So, in a single move, white has gained some 60cps or so, by liquidating the enemy pointed chain and creating a friendly unbackwarded pawn. insufficient and that is why it avoids that move, wrongly. Similarly with humans, it is not necessary to calculate anything, but just to recognise a lot of evaluation terms. That is why I think 'The Secret of Chess' has its added value, including as a tutorial. >But I find it hard to believe that it's possible to systematically exploit this in regular tournament conditions. So, the answer is simple: depth and lack of sophisticated evaluation. For example, top engines still completely misunderstand/lack evaluation terms for pointed chains. against Fritz in a KID, when he should have played f5-f4, but instead allowed Fritz to capture on f5. why he lost in 25 moves to Komodo 2 months ago with a knight for pawn handicap. Chess is all about depth, and the greatest depths are found in closed positions, so they are the most complex. The most complex things are understood only last, by both humans and engines alike. In most cases, it's sufficient to exchange one pair of pawns to avoid getting into a closed position. How are you going to avoid that? Isn't a pretty simple opening book going to take care of this? >In most cases, it's sufficient to exchange one pair of pawns to avoid getting into a closed position. How are you going to avoid that? Isn't a pretty simple opening book going to take care of this? No, if changing a pair of pawns cedes a significant portion of the advantage. will make the engine lose 30cps, or going into a closed position. So, it is not that easy to open the position at all. How about a test? Let's play 15 or so moves here on the forum. Your goal is to get a position that is either clearly better for you or so closed that the engine will play it poorly. (An alternative, possibly even more telling test would be that you play out the resulting position against an engine.) What do you think? >How about a test? Let's play 15 or so moves here on the forum. Your goal is to get a position that is either clearly better for you or so closed that the engine will play it poorly. (An alternative, possibly even more telling test >would be that you play out the resulting position against an engine.) What do you think? 1.c4, won't play a whole game, just till the position gets closed. Anyway, I am not able to always close the position, just statistically very frequently, so this might be a game where I am unable to do so. So, should we say 15 moves? So I really wonder whom am I playing. The contest was not whether a human can avoid closing the game against me, but if an engine can do so. So you're playing without opening book? My question is whether it wouldn't be easy to steer away from closed opening positions with an appropriate book. >So you're playing without opening book? My question is whether it wouldn't be easy to steer away from closed opening positions with an appropriate book. Of course, I am playing without opening books, why do a need a book, only to repeat moves someone has already played. Besides, I am not playing against a book, but against an engine. No, it would not be easy, because you just ceded 20cps advantage with d5. My answer is 3.cd5, after which white has traded a weaker semi-central c pawn for a central d black pawn. Most probably, in centipawns, a d pawn is stronger than a c pawn by about 1/5 of a full pawn. Fischer has won countless like those with white. Btw., neither Stockfish or Komodo ever consider 2...d5 on my system, preferring e5 instead. How do you avoid learning any opening theory yourself? And if you use an opening book while the engine doesn't, that automatically gives you an advantage. Also, opening books will lead to more variation in what the engine plays. > My answer is 3.cd5, after which white has traded a weaker semi-central c pawn for a central d black pawn. > Most probably, in centipawns, a d pawn is stronger than a c pawn by about 1/5 of a full pawn. > Fischer has won countless like those with white. Any idea how often Fischer played the Grunfeld with black, and open Sicilians with white? Edit: Let me add a board.